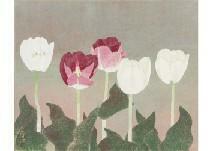 Find artworks, auction results, sale prices and pictures of Shunko Mochizuki at auctions worldwide. 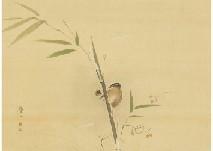 Sparrow MOCHIZUKI Shunko (a set of 2) ink and color on silk, 26x36.2cm, signed and sealed, mounted for scroll, with a box, this lot accompanies another work; KITAGAMI Seigyu【Wave and Flowers】(ink and color on silk, 45x51.3cm, signed and sealed, mounted for scroll, with a wood box signed by the artist). Tulip MOCHIZUKI Shunko ink and color on paper, 51.4x62.5cm, signed and sealed, with a sticker signed and titled by the artist, framed.